I'm a huge fan of all things science fiction, which of course means I love the classic 1976 film Logan's Run with Michael York, even though not else everyone does. 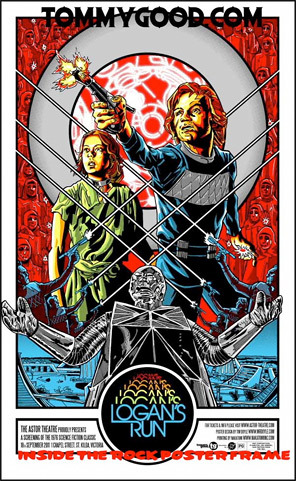 I actually saw it for my first time just last year and still loved it, which is why I'm happy to feature these rather colorful and sleek new designs for a Logan's Run poster made by artist Tim Doyle (via SlashFilm). The new print, with alternate colored variant, comes from Inside the Rock and includes a watermark for tommygood.com, which is where they'll be going on sale in a few days. I'm not crazy for this design, but it's a sleek update on the original, and worth seeing anyway. These new Logan's Run prints were made for an upcoming screening of the film at the Astor Theatre in Melbourne, Australia on September 18th (more info). Tim Doyle designed the art, which is being sold in limited editions of 200 (L) and 60 (R) at a size of 16" x 26" printed on 100 lb cougar white stock. Some of Doyle's recent work includes that Fanboys 'Liberty Leading' poster and Kevin Smith's Clerks update. As cool of a design as this is, I'm still more excited to see Nicolas Winding Refn team up with Ryan Gosling for the Logan's Run remake. And I hope we get some incredible posters for that movie, whenever it gets made, too! Looks more like Lion-O from ThunderCats. wow. these. are. bad. doesnt even touch the original!! http://www.impawards.com/1976/logans_run.html charles moll is the don. I must have missed the sequence where Logan suffers terrible facial burns and is disfigured for the rest of the movie. Despite this, it's great to see The Astor still going (relatively) strong. Ah for the days of my youth, going to the all night horror marathons with my friends and having shouting matches with people complaining that our weed smoke was obscuring the projector. good times.